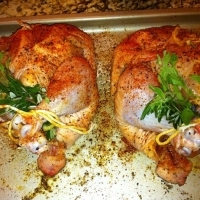 A simple Cornish Hen recipe that my mom shared with me awhile back. Very Delicious! 1.Preheat oven to 450 degrees F (230 degrees C). 2.Rub hens with 1 tablespoon of the olive oil. Lightly season hens with salt and pepper, and chicken seasoning both inside and out. Sprinkle the chopped Thyme, lemon wedge and 1 sprig rosemary in cavity of each hen. Arrange in a large, heavy roasting pan, and arrange garlic cloves around hens. Pour 1/3 C chicken broth into the roasting pan. Roast in preheated oven for 25 minutes. 3.Reduce oven temperature to 350 degrees F (175 degrees C). In a mixing bowl, whisk together wine, chicken broth, and remaining 2 tablespoons of oil; pour over hens. Continue roasting about 25 minutes longer, or until hens are golden brown and juices run clear. Baste with pan juices every 10 minutes. 4.Transfer hens to a platter, pouring any cavity juices into the roasting pan. Tent hens with aluminum foil to keep warm. Transfer pan juices and garlic cloves to a medium saucepan and boil until liquids reduce to a sauce consistency, about 6 minutes. Cut hens in half lengthwise and arrange on plates. Spoon sauce and garlic around hens. Garnish with rosemary sprigs, and serve. Those look and sound lovely. Bookmarked to try. Great post! Can't go wrong with cornish game hens. The seasoning sounds perfect! Like sweetstacia's recipes? Never miss an upload!